Gildan originated in Canada in 1984, quickly making a name for themselves as a world-wide leader in the manufacture of quality apparel. Being conscientious about a global economy and environmental impact, in addition to their quality products, has given Gildan brand recognition and has earned the appreciation of professionals and consumers alike. Gildan is committed to ongoing, genuine accountability, so you can purchase and wear their clothes, knowing they have been responsibly sourced and manufactured. 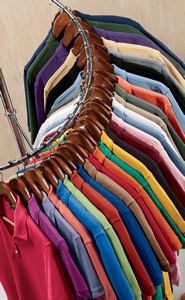 With hundreds of color and fabric blends to choose from, we sell Gildan apparel at wholesale prices you can afford. Whether you buy one shirt or several, our pricing structure allows you to purchase any combination of items, sizes, colors, styles, and brands for a combined quantity discount. Get dad a Gildan polo shirt, mom a Gildan tank top, and Gildan t-shirts for the kids, in all the bright hues and finishes they love. Gildan has Heavy Cotton and HeavyBlend hoodies and shirts for individuals who like to be swathed in the weight of brilliant cotton. Ultra Cotton t-shirts like the Gildan G200 and SoftStyle knits like the Gildan G640 t-shirt are made for those who cherish the ultimate feel of the most luxurious fabric against their skin. Gildan Performance and DryBlend shirts and tank tops are ideal for folks on the go, who prize exceptional breathability and moisture-wicking, antimicrobial garments. For customers requiring quality garments for direct-to-shirt printing, foil printing, screen printing, dye sublimation, heat transfer or embroidery, we have various types of blank Gildan shirts and hoodies ready to receive your work. 100% combed and ring spun cotton t-shirts such as the Gildan Hammer H000 t-shirt is a popular choice for many types of printing and is created by twisting the yarn, so that the microfine tufts of fabric standout, which creates exceptional softness and just enough textural contrast to make your bold designs stand out. Design-specific elements, like shoulder and neck taping, double-needle stitching at points of wear, and ribbed or welt cuffs and collars, are implemented throughout varying products to ensure you are receiving the highest grade construction possible.